The human brain is impressive for many things, not the least of which is its capacity for turning the world around it into a set of complex electrical signals that let you percieve tastes, sounds, sights, touches, and all manner of other sensory delights. However, it is limited in scope: If your body can't physically connect with any given thing, or if the thing itself exists only as lines of code or batches of signals, your brain can't really tell you what it's like. Unless, that is, you've got a Tongueduino, which is a small 5-by-5 vinyl pad that sits on the end of your tongue and feeds your brain electrical signals that allow it to taste and perceive things like the Earth's magnetic field. Developed by Gershon Dublon of the Massachusetts Institute of Technology, the snappily-named Tongueduino has been in existence for around one year. Dublon himself has been rigourously testing the tiny device, which works by converting signals from an electronic sensor into little pulses which the wearer perceives as tingles on their tongue, and is pleased to report that it has now reached the stage where humans other than himself are gearing up to test it. If nothing else, the Tongueduino highlights the adaptability of our sensory organs. If its sensor is set to perceive the Earth's magnetic field, for instance, wearers can use the device to turn their tongue into a kind of slimy, integrated mouth-compass. While we're not talking north tasting like apples and south tasting like pizza or anything, the experiences of the two directions on your tongue would feel different enough for you to be able to distinguish between the two. "You might not have to train much," says Dublon. 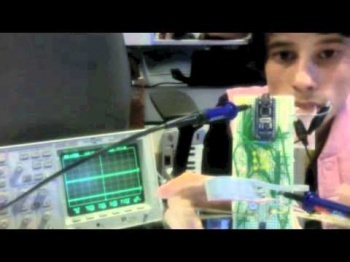 "You could just put [the Tongueduino] on and start to perceive." Then, of course, there are the potential non-mouth-compass applications. What else could this thing tell your brain about? Blair MacIntyre at the Georgia Institute of Technology in Atlanta thinks a wireless version could be supremely useful in a world where humans and machines are moving ever closer to one another. "There's a need for forms of awareness that aren't socially intrusive," he says. He adds that even Google's much-hyped Project Glass requires a headset, something visible to other people around you that takes up space in your visual field. Can you imagine training your brain to read emails with your tongue? Or pinging someone to let them know you'd like to talk by holding your tongue against the roof of your mouth for a specific length of time? You could also quietly call emergency services, technology allowing, by sending some other kind of command from the privacy of your own mouth. And all of this, dear readers, is before we even get to considering the potential this thing could have in augmented realities. While not all of this sounds very practical, it is worth remembering that the little Tongueduino is barely a year old. Good luck, little tongue-pad. I look forward to being able to use you to taste-read embarrasing books without anybody on the train knowing in the not-too-distant future (it was for research purposes, okay? Stop looking at me like that).